Kingdoms are a thing of the past, but who can stop you from reliving and experiencing the grandeur of those times? Kingdoms, what we know about them today and what we have read, it clearly speaks volumes about their mammoth courage, not only to survive, but also to be the conqueror by dethroning the other in power. It is also about the periphery of their existence, which was beyond the limits of imagination. I recently read, Shadows of the Northlands, a book by teen author Vishwesh Desai. The story of Shadows of the Northlands, is about a great Empire, which is at war with several forces of different nature. The story of the book Shadows of the Northlands, is about the discovery and more importantly realization, which provokes action, which provokes retaliation and which provokes extinction. The book Shadows of the Northlands, starts with a foreword by the author Ashok Banker, who mentions, "a born writer... Turn the page. Start the adventure", about Vishwesh Desai and his writing. With an interesting book blurb and an even more intriguing foreword, you simply cannot wait to start reading the book. I wouldn't write much about the story of the characters, you can read more about that here. What I want to write about is the strength of the writing, the power of fiction and the intensity of imagination. Vishwesh has penned down a wonderful read as far as the fantasy fiction genre is concerned. Very smoothly, he will make you believe that the kingdom exists, that the people are real and the war is happening. The emotions on display, the right mix of humor and suspense, and more importantly at the right moments, are marvellous. The maps and the sketches in the book, just add more to the refinement of the story. 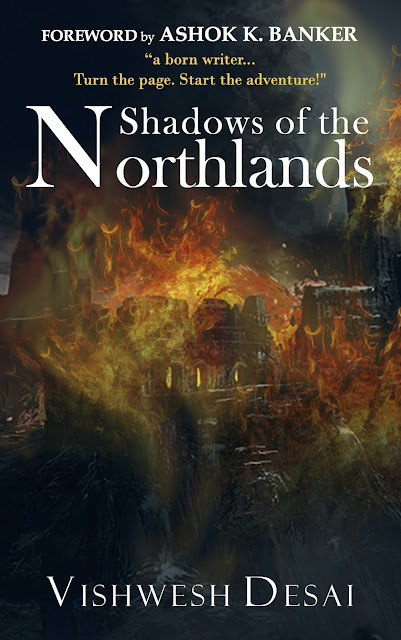 On the whole, Shadows of the Northlands, is a captivating read, believable at a few places and unbelievable at the other, because of the sheer writing prowess on display by the author Vishwesh Desai. I would recommend Shadows of the Northlands, an action packed 480 page fictional fantasy drama to anyone to anyone looking to read something really good in fiction. I am sure that you are going to like it. Do share your thoughts here, when you have read the book.